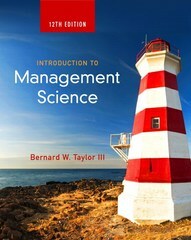 Introduction to Management Science 12 Edition For undergraduate courses in Management Science. A logical, step-by-step approach to complex problem-solving Using simple, straightforward examples to present complex mathematical concepts, Introduction to Management Science gives students a strong foundation in how to logically approach decision-making problems. Sample problems are used liberally throughout the text to facilitate the learning process and demonstrate different quantitative techniques. Management Science presents modeling techniques that are used extensively in the business world and provides a useful framework for problem-solving that students can apply in the workplace. The Twelfth Edition focuses on the latest technological advances used by businesses and organizations for solving problems and leverages the latest versions of Excel 2013, Excel QM, TreePlan, Crystal Ball, Microsoft Project 2010, and QM for Windows.